The Centre: The Australian Research Council (ARC) Centre of Excellence in Policing and Security (CEPS) was established in 2007 under the ARC Centre of Excellence special initiative to boost policing and security research capability in Australia. CEPS extensive network of industry and international partners provide a critical framework for researchers and students to undertake highly innovative, inter-disciplinary and collaborative research internationally and nationally, enriching the research and policy impact and outcomes of research. CEPS research leadership shapes policy and practice reform to strength the security and wellbeing of Australia. Griffith University is offering two PhD Scholarships (for commencement before end of 2014), to train a new generation of historical researchers in inter-disciplinary approaches to criminal justice. The two PhD Scholarships will be part of the ARC Laureate Fellowship project team to be led by Professor Mark Finnane. The ‘Prosecution Project’ will investigate the successes, failures and limits of the criminal trial in Australia from the colonial era to the post-war decades. Using the rich resources of Australian archives, it will provide an enduring foundational knowledge of Australian criminal justice in its historical and international context. The Australian Research Council (ARC) Centre of Excellence in Policing and Security (CEPS) was established in 2007 under the ARC Centre of Excellence special initiative to boost policing and security research capability in Australia. The CEPS extensive network of industry and international partners provides a critical framework for researchers and students to undertake highly innovative, inter-disciplinary and collaborative research internationally and nationally, enriching the research and policy impact and outcomes of research. CEPS research leadership shapes policy and practice reform to strength the security and wellbeing of Australia. Successful applicants will have an appropriate Honours 1 or high 2A (or equivalent) undergraduate degree in a relevant social sciences or humanities discipline (especially history, law and criminology). The candidate will be enrolled full-time. The stipend is valued at AUD $29,844 per year (tax free), and an additional $5,000 top-up scholarship – a total of AUD 34,844 per year. The scholarship will be awarded for four years. Research allowance will be made available by the enrolling school. Students can also apply on a competitive basis for additional funds up to AUD $3,000 for conference presentations and approved research activities. Successful international students will be awarded a tuition scholarship and have their international student tuition fee waived. Closing date: Midnight (AEST) 30 April 2014. Workshop at Aston University on Thursday 19th December: “Investigative Interviewing through an Interpreter”, targeted specifically at police officers and legal professionals. In the light of the EU Directive which recently came into force in October 2013, there will be new obligations for police officers to provide quality interpreting as well as translation services. This year we will be performing role plays with experienced interpreters to demonstrate and highlight how interviewing through an interpreter is a complex activity which requires specialised training. Speakers for the day will include Dr Krzysztof Kredens, Dr Yvonne Fowler and Dr Nicci MacLeod. 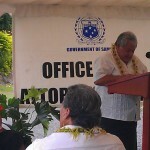 Yesterday, Samoa’s new Narcotics Lab was officially opened by the Prime Minister, Tuilaepa Aiono Sailele Malielegaoi. 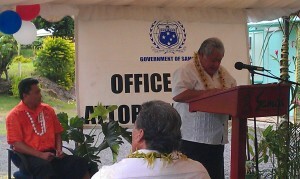 The ceremony was presided over by the Attorney-General, Aumua Ming Leung Wai. 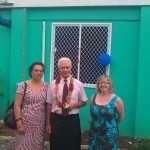 The new laboratory is located at the Scientific Research Organisation of Samoa, and is presently equipped with capabilities to test for marijuana, but this capacity will be increased in the future to other drugs. The Australian government has contributed to the funding of the new lab. 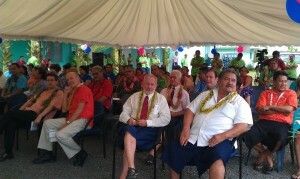 The new lab will strengthen the abilities of the Samoa police with regards to enforcement of drug laws. I attended the opening with the Ombudsman, Maiava Iulai Toma, and my counterpart, Hai-Yuean Tualima, who is the Human Rights Education and Communications Officer here in the Office of the Ombudsman. 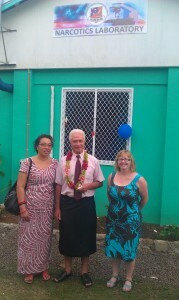 Pictured here are: Ombudsman, Maiava Iulai Toma, Hai-Yuean Tualima, (Human Rights Education and Communications Officer) and me outside the lab. View of the audience gathered for the opening, including the Australian High Commissioner Dr Stephen Henningham in orange in the front row. The Attorney-General and the Prime Minister.